Hauskaa lauantaita, tervetuloa Allsorts haasteen pariin! Syksyistä tunnelmaa toivotaan viikon askarteluihin. Malliksi leimailin syksyisen maisemakortin valkoisella taustalla. Hi; Happy Saturday, it's time for a new Allsorts Challenge! "Feels like Autumn" is DT Ellie's theme for this week. I'm looking forward to see those warm colouful creations. Stamped Penny Black "on the lake" several times in WeR "misti"
with Distress Inks and sprayed water, few lines with brush. Stitched square is Lawn Fawn's diecut and backpaper is embossed in Die'sire folder. A lovely scene Mervi which looks great in the frame, really makes it stand out. 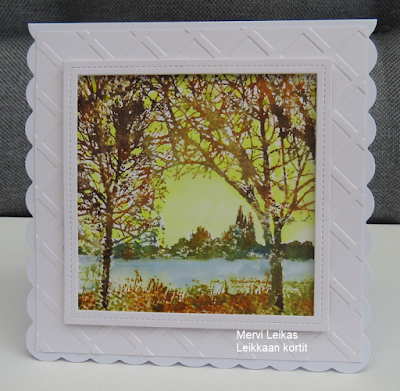 What a beautiful stamp Mervi, and loving the autumnal colors, so pretty! Gorgeous scene Mervi, really beautiful colours and a fabulous design of the card. I have this Penny Black stamp and I love how you used it! 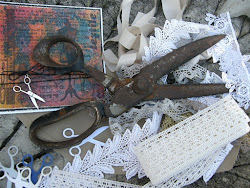 Thanks so much for playing Simon Says Stamp Wednesday “Clean and Simple” Challenge! Beautiful colors and design. Well done! I just love that card and all the elements you used to make the scene. Thanks for playing with us at Dream Valley Challenges!